A new one-half ounce 2014 Doctor Who Silver Proof Coin is now available from the Perth Mint of Australia. Depicting a struck Dalek, it is the first issue from the Doctor Who Monsters series dedicated to some of the most memorable foes encountered in the fifty years of the television program. 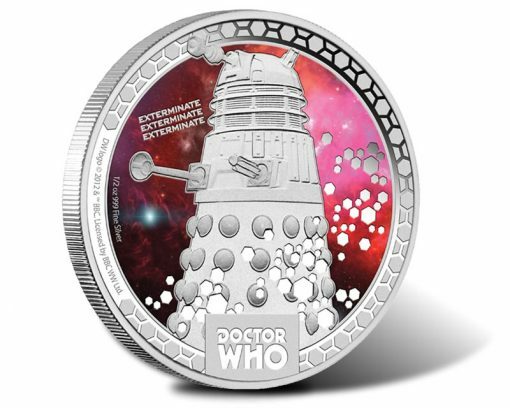 This new release is composed from one-half ounce of 99.9% pure silver with a reverse design depicting one of Dr. Who’s enemies, a Dalek against a colored background. Mintage of the silver coin is limited to 5,000. Dr. Who is the longest running and most successful science fiction television series of all time. Throughout its fifty-year history, the program has pitted a time traveling, humanoid alien known as the Doctor against many formidable adversaries including the Dalek. The Daleks first appeared in 1963 where they waged war on the inhabitants of the planet of Skaro. In the show, they followed Dr. Who to Earth only to eventually be annihilated in, "The Last Great Time War." Previous Doctor Who coins have proven popular with collectors. They include the Doctor Who 50th Anniversary Silver Coin which launched last June and a special 11-coin Doctor Who Anniversary Set that followed in October. Surrounding the Dalek and colored background is a fine border with "DOCTOR WHO" inscribed below. "EXTERMINATE EXTERMINATE EXTERMINATE" is found inscribed to the left along with, "1/2 OZ 999 FINE SILVER." This coin is produced by the Perth Mint under official license of BBC Australia & New Zealand for the New Zealand Mint. Each is legal tender of the South Pacific island nation of Niue with a face value of 1 dollar. Shown on the obverse is the Ian Rank-Broadley effigy of Queen Elizabeth II. Obverse inscriptions include "ELIZABETH II," "NUE," "ONE DOLLAR" and "2014." The artist’s initials appear below the portrait. Pricing of the release is now shown as AUS $68.18, or US $61.62. Each ships in a classic presentation case with an illustrated shipper depicting a Dalek and a numbered certificate of authenticity. A subscription program is also offered. Subscriptions entitle the purchaser to the five Doctor Who Monsters Silver Coins as they are issued. Doctor Who logo ™ 2012 & ™ BBC. Licensed by BBCWW Ltd. DALEKS (word marks and devices) are trade marks of the BBC and are used under license. $61 for a half ounce of silver? That’s more than a proof Silver Eagle. I guess that’s what they can get for only minting 5,000. At almost $62 US for 0.5 oz perhaps the coin will Exterminate itself.